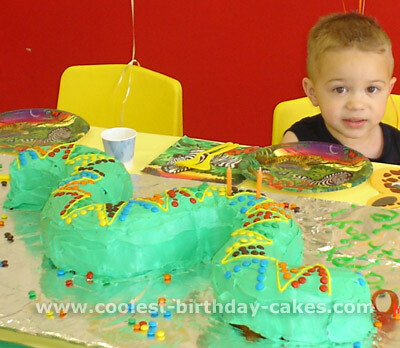 This birthday cake decorating idea was a huge hit! We decided to have our son’s 3rd birthday Animal-themed since he loves animals. 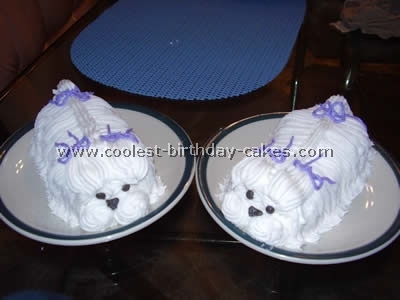 Thanks to this site I was able to browse through many animal cakes and ultimately I decided to go with this birthday cake decorating idea. I followed the suggestions of using 2 bundt cakes (one chocolate and one yellow) and sculpted the head with bits of cake that we shaved off of the tail. I made a batch of butter cream frosting which I tinted green (liquid food coloring) a can of white frosting which I tinted yellow and a batch of chocolate frosting. I used a red pepper for the tongue and a couple of chocolate chips for the eyes. It was time consuming but not hard at all. I didn’t have a #21 star tip to pipe the frosting and so we used another number #27 I think which was way too small and was taking too much time so I switched to a different kind of tip that was larger and allowed more icing to flow. Up close it wasn’t very good but the kids didn’t care and the adults didn’t either. It tasted great! Tip: I baked the cakes the morning prior and froze them overnight. I brought them out the morning of the party and frosted them, then put the cake in the back of my car until the party. In the future I would do the whole thing a day earlier as the cake can sit out and this way it frees up my morning so it’s less stress! Good luck with your cakes! I used this website to find a birthday cake decorating idea and the process was pretty darn easy: I started off by making two bundt cakes a day ahead, wrapped them in plastic and placed them in the fridge. 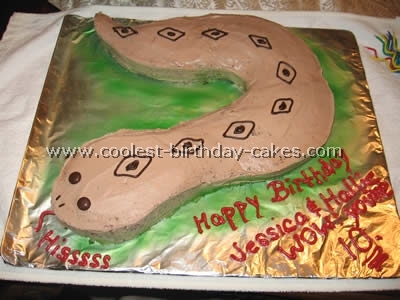 The next morning I cut the cakes in half and assembled three of the halves together to get the snake. I shaped the head and the tail with a knife and then covered the entire cake in butter cream icing. I covered the head and tail in white fondant (each about half of one of the bundt halves). Then I rolled and then cut out multi colored fondant ovals and overlapped the ovals on the cake body giving scale effect. The eyes are fondant with a full sized chocolate chip for the eyeball. I also added rainbow fondant strips for the ‘rattle’ and used red (cherry) fruit leather for the tongue. I used one standard chocolate cake mix and canned icing for this birthday cake decorating idea. I baked the cake in a regular rectangle cake pan and froze it to make cutting easier. I then cut it into sections piecing the sections together into a snake pattern. 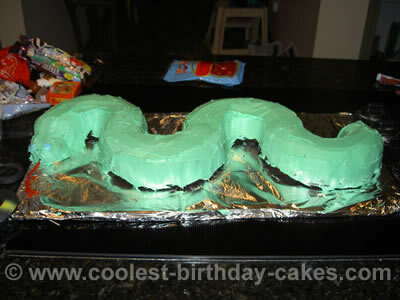 Used icing to help join the various segments together and then used the snakes pattern design to help cover up the joint segments. The chocolate eggs are kinder eggs. They have a toy surprise in the middle so in addition to the surprising treat of the hatchling gummy worms (baby snakes) each child got a Kinder Egg to eat with an enclosed toy inside the egg. The tongue was red licorice and the fangs were unsalted almonds. 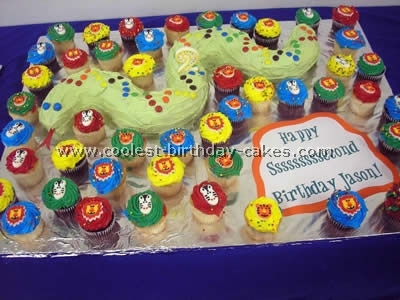 This was the perfect birthday cake decorating idea for a snake-themed birthday party that included a presentation by a Reptiles Alive educator with live snakes! This was such an easy birthday cake decorating idea. I baked 2 bunt cakes. I let them cool and then wrapped them snuggly in plastic wrap. I put them in the freezer over night to firm up taking them out the next day to thaw and then decorate. I made up a batch of White butter cream frosting and a batch of Chocolate butter cream. To get the vibrant black I added black coloring to the chocolate frosting and no taste red and yellow to the white frosting to make the other colors needed since this was going to be a coral snake. I cut each bunt cake in half and then butted the ends opposite together to get the "S" shape. I star tipped the entire cake with a #21 tip. For the eyes I used Gummy round, for the pupils I used bright red gum balls and for the tongue a red twizzler cut down the middle to give the forked tongue effect. I surrounded the cake with different critters I found at the Dollar Store along with a few gummy worms. 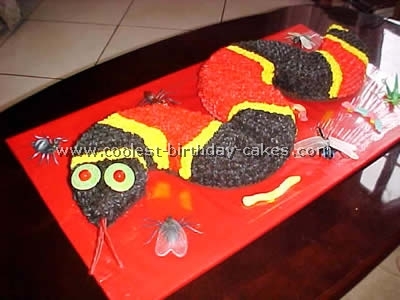 I call this cake a "Creepy Crawler Critter Cake" A dream come true for any little Boy’s Birthday. Did this for my friend’s son’s party! 2 Bundt cakes cut in half to form the body, M&M’s for the back, gumballs for the eyes and a construction paper tongue! The Cupcakes topped off the birthday cake decorating idea. My niece and little cousin are both animal and reptile lovers. For their 9th birthday’s (they are born two weeks apart and are not only cousins but best of friends) they asked me for a snake birthday cake. For this birthday cake decorating idea I used a 9×13 pan and made her favorite chocolate cake. After it had cooled I cut it into a snake shape using pieces I had cut off to form around to make more of the slithering snake look. I then frosted it with the chocolate icing and used a black icing to draw the designs on it’s back. For the eyes I used brown M&M’s and for the tongue I used a piece of red licorice. 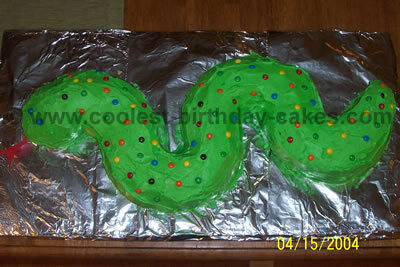 I put it on tinfoil on a cookie sheet and with green spray icing sprayed the tinfoil to look like the snake was on grass. With red icing I used a tip to say happy birthday to my niece on the tinfoil. It was a huge hit as you can see by the look on their faces. This birthday cake decorating idea was made by quartering bunt cakes and laying them in alternating patterns. The cake was covered with buttercream icing, and smoothed by using ‘Viva’ paper towels, just lay the paper towel over the icing and rub softly in small circles. The warmth of your hand will mold the icing, and it will be super smooth (it must be Viva paper towels, or else it won’t be smooth). 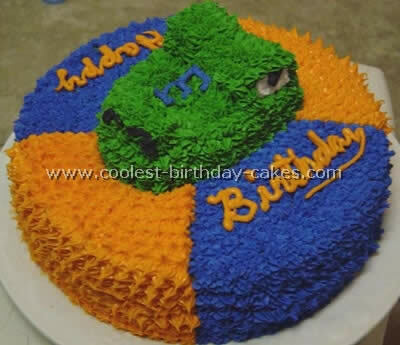 Cut out fondant circles and place them all over the cake. The tongue is fondant also (don’t put it in until the last second or else it will melt in the snakes mouth and fall out). 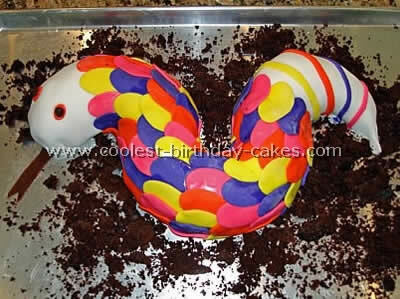 To make this birthday cake decorating idea I used two 8" round pans and cut the shape for the snake from those. I pieced them together using frosting to hold everything in place. It was then frosted using a star tip, mini chocolate chips and M&M’s make up the snakes spots. I also used a grass tip with green frosting for a little added touch. My 6 year-old loved it. Success! I made one chocolate cake and one vanilla cake, each in a bundt pan. When the cakes cooled, I cut each cake in half and laid them out on the cardboard. When I laid them out, I flipped every other 1/2 so to get the curved appearance. I cut the tail end into a point and took a little off of the face end to give it the "v" shape. I iced the whole cake with icing that I dyed green and then decorated the whole snake with miniature M&M’s. I kept the M&M’s off of the head of the snake, so that you could see the eyes and then I cut a piece of construction paper for the tongue. You could also use some fruit by the foot to make the tongue by cutting into shape. This birthday cake decorating idea was for my son’s 5th birthday party and he enjoyed decorating the iced snake with the M&M’s. 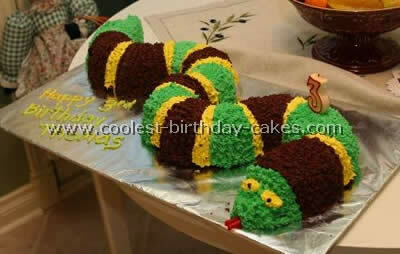 For this Snake birthday cake decorating ideas, prepare 2 bundt cakes. 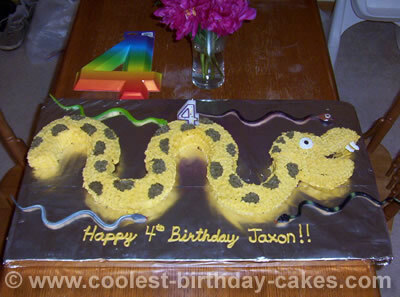 Cut the cakes in half and place together in a snake pattern. I froze the cakes before frosting them. I made green frosting, used M&Ms for eyes and red licorice for the tongue. 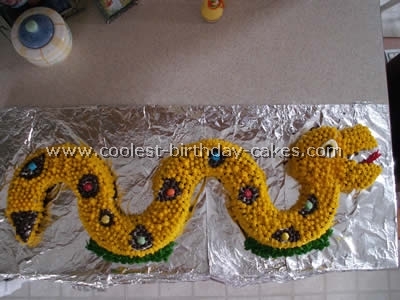 For this snake birthday cake decorating idea, I baked two 9in round cakes. Then I cut out the middles, going in about 2-3 inches. I cut the cake rings in half, then positioned them in a wave and frosted them together. For the head I used the middles of the round cakes and just carved out a head the best I could. The eye is a marshmallow with a chocolate chip in the middle, the teeth are 2 penne pasta’s frosted white. I star-tipped the whole cake, using yellow with brown spots. My two year old loves animals so I did a safari birthday. 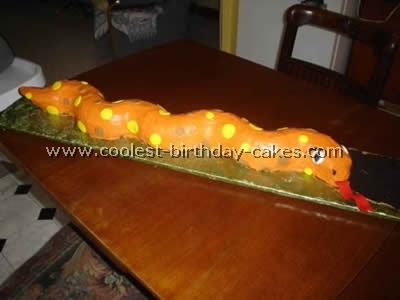 I decided to do a snake cake. 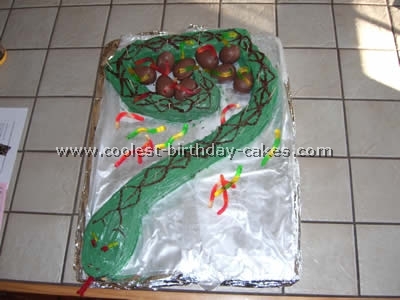 I had read that you could make a snake cake by using two bundt cakes. So, I decided to use a chocolate cake mix and a vanilla cake mix to give the guests a choice. All I did was make two separate bundt cakes and cut them each in half. I got a long piece of cardboard and wrapped it in tinfoil. Then I connected the four parts of the cake in an -S- shape. I used two cans of white frosting and green food coloring to frost it. Then my friend and I just kind of brainstormed the design on his back. For our birthday cake decorating idea, we used yellow icing (icing tube from Walmart) and made the zigzag design first. Then we used a bag of mini M&M’s and color-coded the pattern. I used a fruit roll up for the tongue. It was SOOO easy and a big hit!